A writing resource for graduate students. Have you been told that you have a lot of ideas when you write but that they are not always organized? Do you find yourself frustrated when you are asked to connect what you have learned about a child to your course readings? Does the idea of generating research for a paper seem daunting? As a graduate student, you will be expected to write in ways that serve various purposes. Some assignments will ask you to reflect on an educational experience and make connections to course concepts and readings. Others may require you to research a topic to develop new insights. Writing will be one of the critical means through which you will demonstrate the knowledge you are acquiring during your time at Bank Street. Peggy McNamara, Senior Director of Student Learning Support and Community Initiatives, can support you in developing your academic writing through individual or group consultations and assess whether you are a good fit for the Writing Assistance Program, which provides current graduate students with individual tutoring from Bank Street alumni. Tutoring is contingent on the resources and schedule availability of the program. To explore opportunities to support your growth and development in writing, contact Peggy McNamara at mam@bankstreet.edu or 212-875-4586. 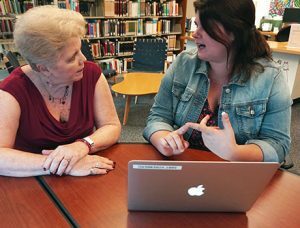 The Graduate School Writing Assistance Program provides individual tutors for matriculated students who are encountering difficulties with written assignments in their courses or fieldwork. Students can request assistance or be referred by a course instructor or advisor. There is no cost to students, however, students must commit to meeting weekly with their tutors. Tutors are Bank Street Graduate School alumni who have been prepared to work with adult learners. Students’ applications will be reviewed and writing needs will be assessed to determine if tutoring is the appropriate resource. If you find yourself challenged by the demands of academic writing in your courses and fieldwork, please contact Peggy McNamara, Senior Director of Student Learning Support and Community Initiatives at mam@bankstreet.edu. The following Google Drive Folder includes reading and writing references from Hunter College Reading and Writing Center. These resources will be helpful as you review the most effective academic reading and writing strategies that will support your graduate studies.